John R. Schindler is a historian (Ph.D., McMaster) and former Department of Defense official who has written widely on terrorism, intelligence, and the First World War. 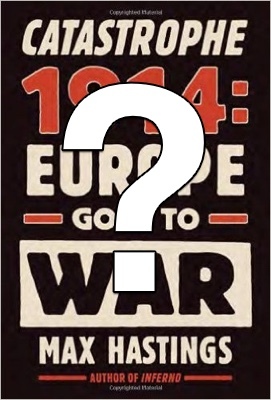 Several months ago I made the unpleasant discovery that sections of the 2013 best-selling book Catastrophe 1914: Europe Goes to War by Sir Max Hastings, the prolific British popular historian, looked an awful lot like one of my scholarly articles. Of course, plagiarism is among the gravest of charges among historians so I explained the situation in open-letter format, a post on my blog, expecting some sort of a reply from Hastings or his publisher. As I have received no reply of any sort, although I know through third parties that Hastings is aware of the matter, it’s time to explain this matter in detail – and let you decide if this is plagiarism or not. Chapter Four of Hastings’ book is titled “Disaster on the Drina”1 – which just happens to be the title of my article published in the academic journal War in History eleven years before.2 Nowhere does Hastings mention that he has “borrowed” my article title for his chapter title. Both discuss the ill-fated Austro-Hungarian invasion of Serbia in August 1914. This is especially germane because “Disaster on the Drina” is the also the title of a chapter in my newly released book Fall of the Double Eagle: The Battle for Galicia and the Demise of Austria-Hungary. Hastings’ Chapter Four draws directly from my War in History article, without attribution in endnotes. In particular, his account closely mirrors my discussion of the 15-16 August Battle of Cer Mountain in Serbia, the war’s first Allied victory. My 2002 article published ground-breaking research which I had discovered in Vienna’s famed War Archive (Kriegsarchiv) about this engagement, which is little known outside the Balkans, despite its historic significance. Before my article, there was no published source that explained the Austro-Hungarian side of that important defeat at the very outset of the Great War. My article, page 172: “In the brutal struggle most of the officers fell, including Colonel Joseph Fiedler, the first of 35 Habsburg colonels to die at the head of their regiments in 1914.”4 I deduced this fact by painstakingly going through yellowed casualty lists in the Kriegsarchiv, and Hastings had to have learned this from my article, but he does not cite it. Hastings’ very next sentence is likewise similar to mine: “The divisional commander seized a rifle and fought at close quarters alongside his staff.”5 This comes from my article’s page 172, which discusses the fate of General Artur Przyborski, commander of the ill-fated Austro-Hungarian 21st Division on Cer: “As Serbian attacks came closer, the divisional commander, wielding a rifle, led the defense of the headquarters area. Przyborski at one point only had 20 men around him, many of them staff officers….”6 As I learned these facts from the 21st Division’s official report of Cer, which was written a week after the battle and can only be accessed in the Vienna archives, and which Hastings does not cite, this had to come from my article, unattributed. Compare with my article’s page 173: “Serbian casualties included 47 officers and nearly 3,000 men; their 6th Regiment lost all four battalion commanders and 13 of 16 company commanders.”8 Since I did not do archival research of the Serbian side of the battle for my article, I learned these figures from another author, who was cited in my article: as Hastings does not cite that author, it appears he lifted this, almost verbatim, from my article without attribution. Hastings’s next sentence is very similar to mine as well: “Cavalry harassing Austrian rearguards suddenly found themselves facing machine guns; which in a minute or two of firing annihilated two squadrons rash enough to charge them.”9 My version, page 173: “The charge of a Serbian cavalry regiment was cut short by the annihilation of two of its squadrons by the 6th Regiment’s machine guns.”10 This fact came from the Kriegsarchiv, specifically from field reports written in August 1914, which Hastings nowhere cites, so this, too, has to be taken from my article without attribution. It is important to note that Hastings does supply 158 endnote citations for his Disaster on the Drina, which refer to several sources, nearly all secondary, but nowhere is my identically titled article cited as a source, even though when Hastings went to press it was the sole scholarly work in English on the Cer battle.13 My work’s only appearance is in the bibliography, where it is oddly misrepresented as “Disaster on the Drina: The Austro-Hungarian Army in Bosnia”14 – its actual title says Serbia. Hastings seems to have a problem with accuracy as well as attribution. Whether this rises to the level of plagiarism I leave to you to decide.